A simple French-style potato salad. The recipe is adapted from one by Julia Child. In a large bowl, add the shallots, 1/4 teaspoon white pepper, chicken stock, vinegar, and parsley. Stir to combine and set aside. Fill a 3-quart saucepan with cold water. Wash the potatoes. One at a time, peel a potato. If it is round and fat, cut it in half lengthwise. 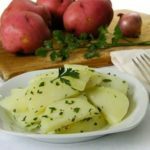 Cut the potato into 1/4-inch slices and drop the slices into the water in the pan. Once all the potatoes have been sliced, drain the water. Add clean cold water to cover the potatoes and the salt. Over medium-high heat, bring the potatoes to a simmer and lower the heat to medium-low. Simmer potatoes 2 to 3 minutes, or until the potatoes are just tender. You can test using a fork or by eating a slice to be sure. Do not overcook potatoes or they will fall apart. Drain out the cooking water and cover the pan. Set aside for 3 to 4 minutes. Uncover the potatoes and transfer them to the bowl with the stock and shallot mixture. Gently toss to coat the potatoes with the mixture. Let set for 10 minutes or so, tossing gently every few minutes. Taste and correct seasoning as needed with salt and pepper. If using olive oil, add it to the mixture and gently toss with the potatoes. Serve and enjoy. Refrigerate leftovers in a sealed container for up to two days. Adapted from "The Way To Cook" cookbook by Julia Child.